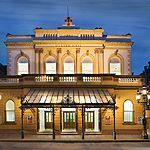 Over the years Ulster Hall has played host to many famous figures including Charles Dickens, Caruso, Lord Carson, Dalai Lama, Barry McGuigan, the Rolling Stones and many more. Do you work at Ulster Hall? Ticket prices vary by event, please contact the venue for details. What did you think of Ulster Hall?